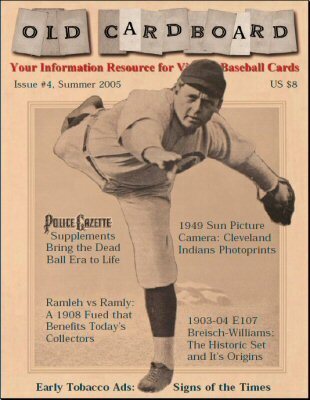 The cover and the table of contents for Issue #4 are shown below. 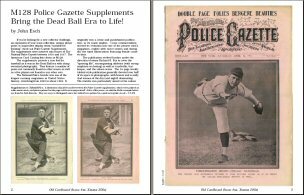 1) "M128 Police Gazette Supplements Bring the Dead Ball Era to Life!" by John Esch. 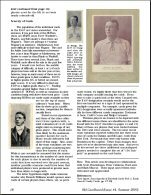 Our cover feature details information about the Supplements issued with the weekly National Police Gazette from 1901 through 1917. 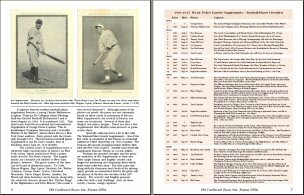 The author's knowledge of the Gazettes stems from his collection of the most complete run known. 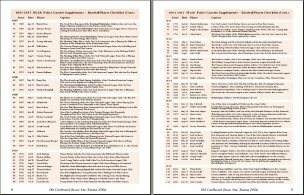 Included is a first-time published comphensive checklist of all known baseball-themed Supplements. 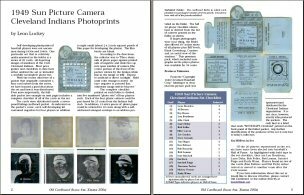 2) "1949 Sun Picture Camera Cleveland Indians Photoprints" by Leon Luckey. 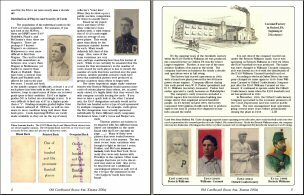 A brief but fact-packed overview of this set by advanced collector Luckey provides insight about how the cards were packaged and how the self-developed pictures were produced. 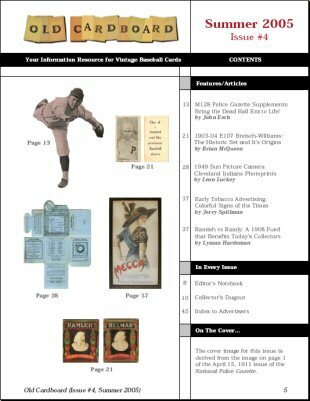 A complete heretofore unpublished checklist is also included along with a picture of a rare foldout package used for distributing the cards. 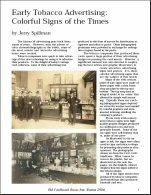 3) "Early Tobacco Advertising: Colorful Signs of the Times" by Jerry Spillman. 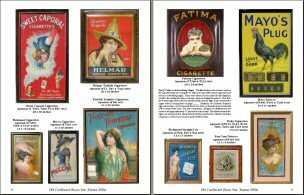 Second-time Old Cardboard author Spillman provides a very colorful display of late 19th and early 20th century tobacco advertising signs. All signs shown promote brands that also sponsored vintage baseball card sets. Two accompanying photos of the interiors of typical tobacco shops of the period provide a realistic feel for how the signs were displayed. 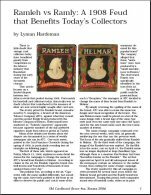 4) "Ramleh vs Ramly: A 1908 Feud that Benefits Today’s Collectors" by Lyman Hardeman. A long-forgotten feud in 1908 pitted the Ramleh brand of the American Tobacco Co. against the "upstart" Ramly brand produced by the Mentor Co. of Boston. 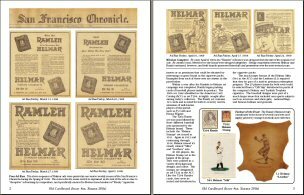 Vintage card collectors today are perhaps the prime beneficiaries of the feud, which is well documented in a series of period ads that ran in the San Francisco Chronicle. 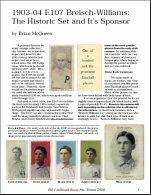 5) "1903-04 E107 Breisch-Williams: The Historic Set and It’s Sponsor" by Brian McQueen. 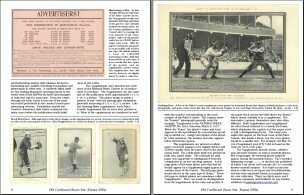 This scarce but historic set--the first major issue of the 20th century--is profiled in some detail along with an informative and easy-to-use checklist. 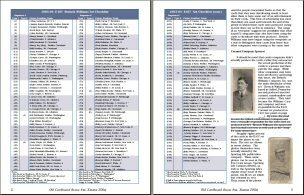 Recently researched background information about the company that sponsored the set (as well as sets E103 "Williams Caramel" and E253 "Oxford Confectionery") is also reported. .